Driving is one of those life skills that makes travelling easier. Being able to drive provides freedom and opportunities. It can also lead to many amusing adventures. Here are a few of mine. Moving to Turkey in my late teens introduced me quickly to driving on the ‘wrong’ side of the road. I learned to drive on the left, but suddenly I was driving on the right. Not only was I consciously trying to remember to drive on the correct side of the road but the mountain roads had sheer drops on one side and often a rock wall on the other which was quite frightening. While driving in Turkey I also noticed (it is hard not to) that there is definitely an increased use of the horn in Turkey. It means ‘get out of the way’ ‘are you turning?’ ‘hello!’ Slow-driving Turks also tend to indicate left (while driving on the right) to communicate with the driver behind them that it is safe to overtake. I could never understand this rule, especially on my way down a bendy mountain road when I indicated left because I was turning left onto a side road and the driver behind me sped up and almost collided with me, potentially sending us both to our deaths down the cliff face. Scary? Very. 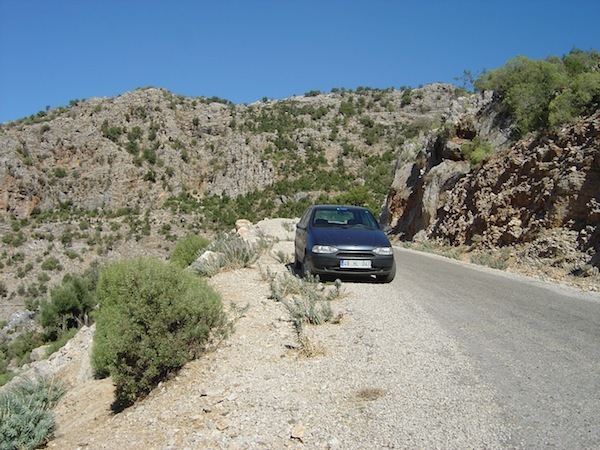 Turkish mountain roads often feature precipices! The land downunder is a perfect place for a roadtrip, but you must be aware of the distances you could end up covering. We all look at maps and we can all easily see that Australia is larger than the entire continent of Europe, so why the distances are constantly being underestimated is a mystery. Driving any distance in Australia is like a survival challenge. It is essential to make sure you have enough fuel until the next petrol station, which is sometimes hundreds of kilometers away. It is wise to avoid driving at dawn and dusk to minimize your chances of coming off second best to an errant kangaroo. You should always have water with you too in case you break down. In America driving is a way of life. Everyone drives everywhere so services have been tailored to drivers. Just about everything from donuts to cash machines are available as drive-thru. It is very convenient, so long as there isn’t a queue or the person in front of you breaks down. As a visitor I found it great fun trying all these things as a drive-thru, but I can see how easy it would be to become very lazy indeed. I also noticed that it is permitted to turn corners on red lights. I appreciated the convenience but thought it weird no investment had been made in an extra ‘green arrow’ light to make this clear. Drivers behind me made it quite clear with their horns though so I quickly got the message. Traffic lights and signs are overhead too which takes some getting used to. Driving abroad is always an interesting experience. For some it is frightening and just less stressful to take a bus or a taxi, but if you are up for it hire a car in Italy, Barbados, Morocco, Canada, Australia. Wherever you go there is bound to be an adventure! What experiences have you had of driving on your travels?